Fun4IM is a browser extension created by the Bandoo Media, Inc. The application is promoted as a tool you could install onto Mozilla Firefox and Internet Explorer browsers and employ to access different emoticons and animated winks when using IM systems. According to the most recent research, the application that has reached its peak back in 2010-2011, is no longer active. Despite this, some users still need to figure out how to delete the suspicious extension from their browsers. We are here to assists you with Fun4IM removal if you are struggling with the operation as well. There is no official website representing Fun4IM; however, the program could be distributed in a non-official manner. 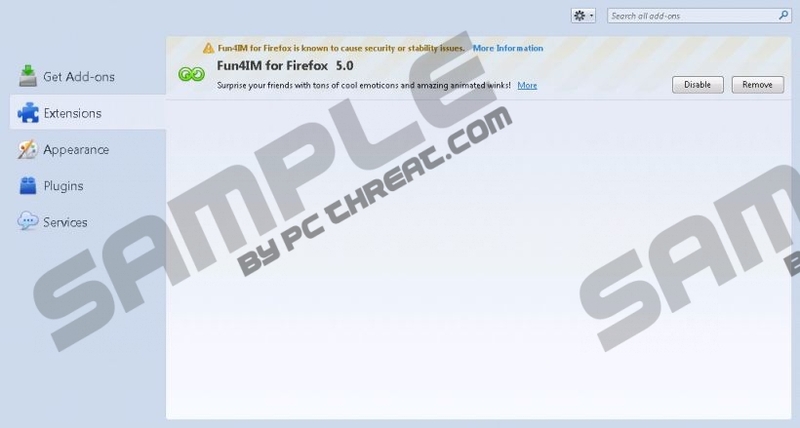 In the past, Fun4IM was usually installed alongside Searchqu Toolbar and other disturbing third-party applications. Once installed, the disturbing program has been noticed to add a Firewall exception, which may aggravate the program’s removal, and initiate an unauthorized connection to the web. It is possible that this connection could be used to gather and send information or enable the connection to remote adware servers. Due to this, Fun4IM is often identified as an advertisement-supported program. If you do not delete it from the PC, you may face an avalanche of different advertisements, and getting them removed might be a whole different challenge. The advertisements flooding the browsers may be related to Fun4IM, or they could show up because of other active advertisement-supported programs. If you are not sure what has caused the avalanche of different ads, we suggest using an automatic malware scanner. Click the download button and install the free SpyHunter’s scanner to find out which programs you should delete from the operating system. If you remove all of them successfully, you will not need to worry about flooding ads, irritating programs, data collecting web cookies, or other potentially disruptive applications. Computer users who are experienced and who have skills with the removal of advertisement-supported software may delete Fun4IM from the system manually. Note that even if the program has an uninstall entry its removal may be highly complex. For example, if you remove Fun4IM from the PC using the steps listed below and some files remain running, there is a great chance that advertisements will continue showing up. If you do know how to remove all undesirable components from the system, begin the removal process with the steps below. However, if you are uncertain about the operation, employ the tools that have been developed for the task – automatic malware removal software. Tap the Windows key on your keyboard to open the Metro UI menu. Right-click on the screen to open a new pane at the bottom. Click All apps and the Apps menu will appear. Select Control Panel and then move on to Uninstall a program. Finally right-click the app you have chosen to delete and select Uninstall. Navigate to the left of the Task Bar at the bottom of the screen. Click the Start button represented with the Windows logo. In the pop-up menu select Control Panel. Click Uninstall a program and locate Fun4IM. Right-click and Uninstall the app you want to delete from the PC. Click the Start icon on the left of the Task Bar. Select Control Panel to access a menu with more options. Scroll to the menu on the left and click Change or Remove Programs. Finally select the undesirable program and click Remove. Quick & tested solution for Fun4IM removal.